Climate Health Risks in Megacities: Sustainable Management and Strategic Planning courageously confronts the immense challenges of alleviating climate change and takes the initiative to layout an agenda that calls for action in the rapidly changing landscape of our global climate. This guide provides a constructive methodology for developing and implementing risk management and operational continuity management systems to climate change effects on urban populations. It addresses key issues such as physical location, proper sanitation, food security and vector-borne diseases against the backdrop of climate change, and then model its effect on the urban dwellers. The author also reveals the benefits of implementing a unique risk management approach to combat global threats and focuses on building urban resilience in the face of disasters. Prepared with a comprehensive and forward-thinking style, this book draws on indispensable case studies in key megacities like New York, Los Angeles, Beijing, Rio de Janeiro, London, Mumbai, and Lagos, and links researchers, scientists, city's mayors, environmentalists, policy-makers and world leaders from central areas to review, reflect, and expound on future directions. "The literature is replete with information on the wide range of threats and opportunities facing the world's largest cities. Cesar Marolla took the next step to examine how these findings affect the public health of the people residing in or visiting these cities. Mr. Marolla also determined how sustainability can be used to address the health of a large portion of the world's population. If you are interested in the `people part' of the triple bottom line, this book is a must read for you." "A body of research shows that forms of governance, social and environmental aspects, can influence a population's health. In developing countries, the rise of megacities occurred without of a suitable plan. Many of them have a high population density, a complex and insufficient system of infrastructure and environmental quality. Climate change can aggravate the health of population living in those megacities. Cesar Marolla presents in this book steps to help better manage and solve issues for those cities. Managers, researchers, and citizens that are interested in urban health will find interesting and scientific valuable information in this book." "Military planners model future threats to the nation and our economic partners to predict areas of potential military conflict. The Department of Defense has seriously evaluated the impacts that climate change will have on the stability of world governments and the ensuing armed conflicts over territory and resources. One of the underlying causes of today's political unrest and violence is the change in available natural resources caused by climate change. There are no single climate change impacts to plan for. The interrelationship of increased temperature, rainfall, sea level, and large storms will result in regional declines to success in farming, hunting and fishing. Food scarcity and increased exposure to diseases will fuel the migration of rural populations to the cities. In this long overdue book, Cesar Marolla has evaluated the climate change factors, described the human and ecological impacts and proposed reasonable methods to achieve a level of sustainability. If you want to make a difference in the future of planet Earth, read this book." "A variety of factors are associated with the risk of infectious and chronic disease, across different domains including lifestyle, social, and environmental factors. By exacerbating existing environmental risks within megacities, climate change presents a unique challenge to deal with the growing public health issues inherent in large, dense populations. Cesar Marolla presents an articulate and comprehensive guide on climate health and how it affects the health of individuals living in megacities, along with practical solutions for megacities around the world. Mr. Marolla reminds us of the pressing need to look beyond ideological boundaries in order to collectively create effective solutions to both mitigate future extreme climate conditions and develop the needed policies and infrastructure when such events inevitably befall us." "Every city has unique challenges and opportunities in adapting to the perils of climate change. Climate change makes weather extremes worse than they would otherwise be naturally. The increasing frequency, intensity and duration of heatwaves in particular will impact the health of the urban poor. This book is a tour de force on how megacities are testbeds of progress in adapting critical human systems to a warming world." 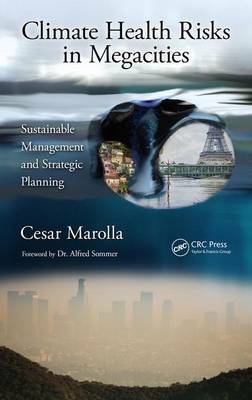 "Cesar Marolla's book Climate Health Risks in Megacities: Sustainable Management and Strategic Planning is a timely and important work that provides a path forward to strengthen and protect our populations in the urban environment. As climate impacts manifest in a world of increasing affluence, urbanization, and inter- and intra-state migration, preparing for and mitigating risks to our cities, and mega-cities becomes ever more critical. With more than half of the world population in urban areas today, Dr. Marolla's book provides an important and comprehensive look at the impacts of climate change on health and security as well as a framework and approach for risk management and mitigation."